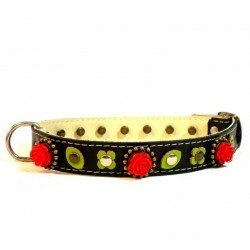 In this category “Kumpel” for medium dogs you can buy your own designer personalised leather dog collar. All my custom dog collars are unique and made from the highest quality Spanish leather and ornaments. I prefer to work with natural materials whose quality I test it with my own dogs and cats. I live in the Mediterranean, where sun and salt are fanatical enemies of each material. This way I get a good picture of the quality and applicability of the used accessories. Many of my designs I offer for dogs of all sizes; but especially for medium dogs and sometimes other reasons, I always relate the design to the specific size and proportion of the collar. Superpipapo designs and manufactures all models itself. You always will find a broad selection of designs for medium dogs for all tastes! If you cannot find anything right now, please visit me again! Make your dog and yourself happy!